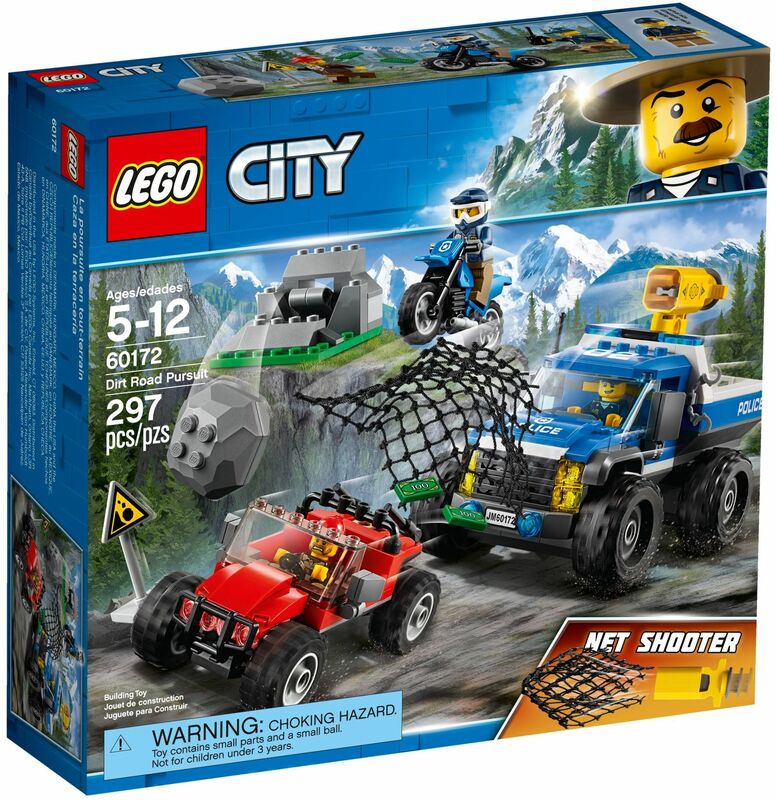 It looks as if LEGO is preparing for the sale of 2018 sets at shop.LEGO.com because an image of City 60172 Dirt Road Pursuit has been found on the server. Unsurprisingly, it's another Police set, but it does have an interesting new feature as you'll see after the break. The yellow gun-like thing on the back of the police truck is a net shooter! It will be interesting to see how far it launches nets and whether it's possible to ensnare the baddies with it! Are you excited for another Police reboot? Thanks to CM4Sci for the tip-off. Always fun with new Lego pieces. I wonder what other sets we will get, it looks mountain themed. I'm surprised there are any criminals in Lego City with all the cops! 2. That massive truck... the police just got AWESOME! 4. DIRT BIKER HELMET! SO MUCH WANT! The truck is cool, the netting (and shooter) is different/unexpected ... but more police? Sigh. There's a new helmet also! New city is moutain themed - we get Moutain Police and Mining vechicles (Yellow-red colorsheme). This theme includes Tan moutain lion, GID spider and black bear also a new 1x1 rock piece (used in ninjago mocie) as gold. is that piece on the front of the buggy a new piece, it looks like it is? I could swear there was a net shooter previously. Or was that a dream I had??? If you don't care too much about the whole police versus crooks theme, Just take the four blue police sirens/flash-lights off, don't apply the police stickers, remove the net-shooter, perhaps tweak it some more, and you got a very nice looking pick-up truck. It reminds me of a Dodge Ram pick-up, or possibly any of those other American SUV type of cars. I look forward to the rest of the city sets plus the Disney, elves and friends sets being unveiled. This has got to be a £30-35 set? He he this does look like fun. At least my four year old son will love it. Looks awesome! This one might interest me enough to buy it. Spring-loaded net shooter? Cool. I'd like to see it integrated into a model better than just slapped on top of it, but it usually takes a while for new launchers to get to that stage. Is it really spring-loaded? It looks more like a push tab shooter to me. Which is disappointing, because in recent years nets were already launched a lot with an aeroplane engine housing. Is it really necassary to create one or two parts specifically to do that? I'll reserve my final judgement for more up-close pictures, but on these pictures it doesn't look like it has a lot of connection points either. Also, that car bumper, is that really necassary? We just received one this year in the jungle theme! These days it seems like new parts are pumped out in a very fast rate. Spoiler alert: I saw a video on YouTube with all the sets revealed,but I'll only be getting the police station with the new cougar,tree costumed crook and of course the new net launcher! I like the dirt bike helmet, but for the love Lego could they please stop with the white goggles! Make it dark gray or black. It killed me when it was in the resistance battle pack. It looks so bad in this. Could it really be that hard to make it in a different color? Isn't that helmet from one of the CMF series paintballer? Also we are getting Jurassic World sets, these net shooters will be around for awhile. Great to get dinos with. Net shooter looks nice and compact. Hoping it works as well or better than the much bulkier brick-built net shooters we've been getting for years. The bar-thing (not 100% sure what it's called) on the bad guy vehicle also looks pretty nifty. So we've finally moved past the "Stuff it in an engine" launcher. Good! Also, I wonder why they didn't just reuse the paintballer helmet.... This new one looks sweet though. Maybe one of the reasons LEGO is having financial trouble is due to the number of new molds they have to make every year! Do we really need a new front grille or a new launcher type? These could both already be done with existing bricks that are likely cheaper to produce. #5955-1 All-Terrain Trapper (2000) had a brick-built net catapult. When the front of the vehicle was pushed, the catapult was triggered. They might have done other net shooters/catapults since then; I don't really know. No, it's because none of the jails have a back wall! Yeah cos crime is rampant not just in the city, the swamps, the forests, but OH MY! THE MOUNTAINS!!!!!! TOO!!!!!!! I've seen a couple more but I can't post them due to the confidential markings but they do look pretty cool! I sense a $40 set due to the chunky tires. That truck is 8 studs wide! There's no need for cars that wide in City. The buggy looks uninspired or even ugly. The dirt bike in blue is not new (#75918). Nice new helmet though. If that net shooter really works and will be produced in black/grey, it would be useful though. Wow Lego City must be more crime-ridden than Gotham! Well, it looks like their back to forest police sets. Hopefully we'll get a bear in a small set this time. police dirt bike, police monster truck... what are they going to have next. Criminals in space, with a police rocket ship? It would be nice if Lego moved away from police motifs until the US gets its militarized police forces to stop shooting unarmed civilians. I find myself resistant to anything that glorifies or normalizes law enforcement. @theleanover most law enforcement officers are not corrupt and the American media greatly exaggerates the few cases where these unfortune incidents have occurred. Most likely with gun control agendas. Many police officers are to protect us and deserve our respect. Moving away from political viewpoints. Law enforcement stories are quite popular with both kids and adults. If you watch TV here in the US then you'll see that it's filled with many many shows about our officers. I saw lots of leaked images of City and Creator for 2018. This was one of the police sets. The net launcher is completely pointless and about as unrealistic as it gets but its about time Lego designed a net launcher that actually works. (although there is a chance it will not work). None of the sets looked that good to me. Most had those large wheels (the ones used by the police ute in this) which I hate. Any rumors for the 2018 Modular building yet? Has there been any leaked images for City Mining yet? As for Police in general I would like to see some different styles of police. Like, I was hoping the Mountain Police would include some Canadian Mounties but the only reference to that is the 'ranger' hat. I would also like to see a French police style sub theme with kepi hats and hatchback cars. Although I would most like to see some old police vehicles. 1955 Buick Century police cars and Sioux helicopters or Wolseley 6 police cars chasing saloon cars. ^ City mining sets did leak out, and they look fairly average. But there is a sort of bucket wheel excavator. @brickchap definetly mounties,also some British constables and a french police style sub would be great! @charliebucket sadly the bear is in the 60$ set and a new mountain lion is in the police station, that’s it for animals apparently. It's getting closer to that time of the year when the rest of the world envies America for having access to the next year's sets in November the year before! A real working net launcher designed specifically for that purpose would be quite cool, actually. Previous net launchers in the aeroplane engine housing have been pretty disappointing. Always happy to see minifigs getting out to the mountains! @theleanover, I hope you're kidding. If you're not, you're probably one of the biggest idiots I've met on this site, perhaps the internet as a whole. @bgreeneidaho, I agree with @theleanover. I have lived my entire life in the mountains and our police is more Andy Griffith, not what you see in this set. And that's the way that both sides like it. It works well for us. Sets like this one just softens up our children to the prepare them for the militarization of America. Shame on TLG. For every Chicago, Atlanta and Los Angeles there are 20 small towns with small town values. There are still plenty of towns where the police know the residents by name, use common sense, not a by-the-book mentality and where the use of military style gear isn't needed. If TLG wants to show this as some sort of off-road police gear, fine. But don't try to make it out as the gear that is in use by the mountain police. As of 10/21/17, 782 people in the US have been shot by police officers. It's not inconsequential that toy makers should evaluate their use of law enforcement imagery. @theleanover: and how many of those people were unarmed? And how many were, in fact, armed and presented a clear and present threat to self and/or others? And how many potential shootings were avoided, and the situation resolved peacefully? My point is, you can't just use one statistic to pass judgement on the system as a whole. It's common sense. Ideas for even weirder City themes: arctic police and underwater firefighters. @willobee. Thanks for answering. 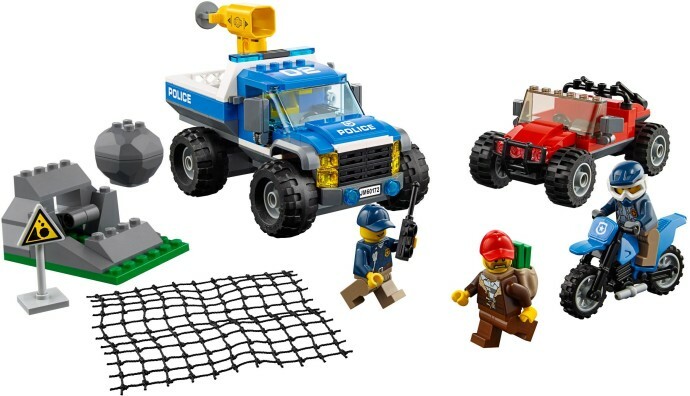 I searched 2018 Lego City mining sets but no images or set name lists came up, although images for the police and great vehicles did. The bucket wheel excavator sounds interesting. @catwheeler Yeah British constables would be great too. The Wolseley 6 cars would go great with that theme. I am still waiting on a 'detective' minifigure with a mustache and wearing a trench coat and fedora. And a police sergeant. Speaking of sergeants, we need more ranks in police/fire. I don't think we have ever got an officially named police chief or any other ranks besides officer. @Tosh8: Arctic police actually sounds pretty cool. But then, I have a weakness for ice-themed sets. The city theme is year by year becoming more toyish and less realistic. Not too strange for a toy company and I sincerely hope these sets speak to the main target audience (i.e. kids). For me, I would like some more realistic vehicles - even if they have to be police - or at least parts that can be used to build more realistic vehicles myself. These big wheels, lack of useable mudguards, roofs etcetera make these sets totally uninteresting for me. A nice off-road motorcycle helmet and that front rack on the red car don't change that. But then again, I'm not part of the main target audience. So let's hope kids love this and it'll fly off the shelves, leaving some room for Lego to release some affordable, more "adult" sets too. @theleanover, GET OFF. and @BuzzFluhart, I live in the mountains, 6,200 ft +. What is your point again? Lol. Well, I think it is nice that city is continuing with the police line, but this does seem similar to forest and swamp police, but I guess that's kind of typical. The net feature looks interesting, though. I'll see if the line looks decent. Good set, but the most interesting thing in this set is the truck. Can't wait to see what Summer of 2018 will bring us. Your comment is the most disgusting comment I have read on this site and you make me ashamed to read that you are also Canadian. I implore the moderators to edit out any overtly political comments on this toy focused website. I can get my full dose of SJW cancer and right-wing bellyaching elsewhere. I will only respond to political comments, but I will NEVER start them. To theleanover, I see you have the power to repeat back Facebook musings, and if I needed to hear SJW arts grad entitlement garbage, I can just go back to university. I strongly support our police forces and polices forces across the United States. They have a very difficult job that grows more challenging by the day, and I want to thank them for working day in and day out to keep my family, my community, and my country safe. No one should be above the law, including the police, and yes they are examples of police brutality, murder, and corruption, and those found guilty should be sentenced accordingly. "It would be nice if Lego moved away from criminal motifs until the US gets its criminals to stop murdering other Americans. I find myself resistant to anything that glorifies or normalizes criminal activity." Of course not however, you have to spew the usual narrative that the police are the problem, when they are the only ones keeping you and your toys safe. Thank you police for all your services to our counties and our communities. Even my 3 year old knows that police cars don't have giant net-gun blasters and dirt bikes. This set is not about normalizing militant police uniforms, but rather building fun toys for kids. Besides being cool, a net blaster would be a non-lethal tool for law enforcement, but yes, even that is an issue apparently. Meh, more police, not unexpected. However, it is nice that LEGO mixes up the police themes though from year to year. I'm just a bit more surprised that people somehow think that the Police theme will not be done each year or two years. LEGO makes what sells, and apparently Police and Fire sell A LOT. If people are still miffed about how much Police and Fire are in these new runs, I say go back to around 1998-2000 when most, if not all, 'City' sets were nothing BUT Police and Fire sets. I remember checking out LEGO 'City' theme sets at the LEGO online shop and seeing nothing but Fire and Police sets (and poorly made ones at that). After that, I can take LEGO making 8-10 (or whatever their std number is) Police and Fire sets a year. As long as LEGO makes other town/city themes/ sets then it is fine for me. As for the silly people that equate all police to some large group of thugs with badges.. Well.. get rid of all police and see how that works for you.. I guess you can try calling the fire dept if your house is being robbed. Are there rotten apples? Yes, of course, but to label a whole police system as that is just narrow minded to put it mildly. A lot of hate on this set, web-wide, but i'm 100% sure my son is going the find this an awesome set! I don't know what exyctly TLC wants to show with these Police sets. That crooks are running around with jail-clothes and drive crazy cars, so the police has to use huge pickup trucks with special weapons to stop them? That set would better fit into a super agents subtheme. You guys take lego to serious. Comparing it to the real world and real situations etc. ^ This. Please everyone, keep politics and religion out of this and stop pushing all your little agendas, whatever they may be. If you think about it logically, when did TLG ever give its police officers realistic weapons anyway? Too many people are reading too much into things nowadays and you can't just accept even a CITY set without political comment. Surely this kind of subject matter is for debate in another forum? Side note I haven't seen any picture leaks, just rumours, but I'm really interested to see the mining side to the January City release, particularly if it has a mini bucket wheel excavator. I guess it won't be long before we see more officially. Let’s hope that the City theme will drop its price level. As it is now, it’s one of the priciest ranges and that doesn’t make sense. I’ve not purchased a City set in years. Those bullbars will be getting used on some HOME-MADE TINY TURBOS. I think this model looks pretty good. I really like that buggy-style design for the criminals getaway vehicle, and how tiny it is in comparison to that beast of a police truck!